Nutritional status of under 5 year children is one of the important indicator of overall development of community and thus country. Children living in rural and tribal areas of India are at high risk of undernutrition because of improper nutrition, sanitation coupled with low hygienic practices and other condition . Children below 5 years of age, pregnant women and adolescent girls are the vulnerable groups for undernutrition in the community. Maternal undernutrition during pregnancy because of lower socioeconomic status, low purchasing power, and poor intake of nutrients results in low birth weight of offspring. Low birth weight is an important determinant of nutritional status of children. Millennium Development Goals (MDGs) had set the target to halves undernutrition by 2015. National Family Health Survey  carried out during 2005-06 reported that the prevalence of underweight was 45% which is considered to be public health problem. National Nutrition Monitoring Bureau (NNMB) also reported high prevalence of underweight (53%) among <5 year children in the rural areas of Gujarat during 2011-12 . In spite of increased food production over the decades in India, along with socio-economic and demographic transition, and the poverty has declined over periods during 2001 to 2011, as reported by National Sample Survey Organization , undernutrition still continues to be an important public health problem. The higher prevalence of undernutrition among children appears to be associated with higher food insecurity, sub-optimal infant & young child feeding practices and high burdens of intestinal, parasitic and other infections. Increase in food insecurity may be because of climate change, increases in food prices coupled with increase inflation . Nutritional status is also influenced by factors such as household income, the skills and capacity of care givers especially mother, use of limited resources for better care of children, as well as local availability of health-care services . Most of the studies carried out in India focus in rural and tribal areas, but few studies in urban slum areas. NNMB also has carried out studies in rural and tribal areas periodically, but not in urban areas. Hence the present study was carried out in rural as well as urban slum areas. Gujarat is one of the economically progressive states in India in terms of industrial growth and infrastructure development; still the prevalence of undernutrition continues to be high in the state. There are five districts (viz; The Dangs, Surat, Navsari, Valsad and Tapi) in Surat region in Gujarat with predominantly inhabited by different tribal population ranging from 50-100%. The tribes mostly living in this region are chaudri, Kumbhi, Dublas, Kathodis etc. The government is planning to implement interventions to curb undernutrition with focus on high burden districts in the state. Therefore, the present study was carried out to assess prevalence of undernutrition and their predictors among fewer than 5 year children in the Gujarat, India. The study was approved by institutional Ethical Review Board and also Scientific Advisory Committee of National Institute of Nutrition, Hyderabad. Oral informed consent was obtained from the mothers participated in the study. It was a community based cross-sectional study carried out by adopting systematic random sampling procedure. Sample size was calculated considering 46% prevalence of underweight (IIPS 2007) (weight for age<Median-2SD) among <5 year children, with 5% absolute precision and 95% confidence interval (CI), a sample size of 375 ~ 400 children per district was required. A total of 2408 HHs (2008 HHs from rural and 400 HHs from urban areas) were covered for the study. A total of 20 Anganwadi centres (AWCs) from each districts and urban slum areas were selected by adopting systematic random sampling procedure from rural/urban ICDS projects. From each selected AWCs, a total of 20 households (HHs) with at least one index child of <5 years were covered. For this purpose, HHs in the selected AWC was divided into 5 geographical areas, based on natural groups of households/streets/mohallas, etc. Households belonging to Scheduled Caste and Scheduled Tribe communities formed one group. From each of these areas, four consecutive HHs were surveyed by selecting a random start, starting from the Northeast corner of the area. In the selected HH, all the <5 year children were included in the study. Data was collected on pretested proforma by post graduate Research Assistants and graduate Field Worker, recruited locally, and were trained and standardized in survey methodologies, by the scientists of National Institute of Nutrition (NIN), Hyderabad. Information on household socio-economic and demographic particulars was collected from all the selected households, using a pre-coded questionnaire. Anthropometric measurements such as length/height (up to nearest 1mm using height/length board) and weight (up to nearest 100g using SECA weighing scale) of the children were measured . History of morbidity such as fever, respiratory infection, diarrhea, etc., if any, during the preceding 15 days of survey was also collected. Maternal particulars such as age, parity, antenatal care (ANC), tetanus toxoid (TT) immunization, receipt of iron & folic acid (IFA) tablets, and particulars of delivery, were collected from mothers of under 6 month children. IYCF practices such as pre-lacteal feeding, time of initiation of breast feeding, feeding of colostrum, duration of exclusive breast feeding and age at initiation of complementary feeding (CF), the type and frequency of CF was assessed for <12 months children. Birth weight of the children was taken from the records available at home, such as immunization card, hospital discharge card, or mother-child protection card. Birth weight less than 2.5 kg was considered as low birth weight (LBW) . Household wealth was assessed by using principal components analysis (factor analysis). Household socio-economic and demographic variables such as occupation of parents, per capita income, land holdings, type of house, source of drinking water, electricity, type of cooking fuel, sanitary latrine and separate kitchen were included in the factor analysis which are proxy for wealth assessment. The first two components explained about 45% of the variance and were weighed heaviest [8, 9]. The regression scores from the first component were used to create an index that was divided into tertiles. “Household’ is defined as those living together under one roof and sharing common kitchen. ‘Pucca’ house means walls made up of cement and bricks or stones and Reinforced Cement Concrete roof (RCC), while ‘semi pucca house’ is one that has brick or stone wall and tiled or asbestos roof, ‘kutcha’ house had mud or thatched walls and thatched or tiled/asbestos roof. Pre-lacteals are defined as any feeding given to the babies before initiating breastfeeding for the first time after birth . The data was scrutinized and entered into the computers at the National Institute of Nutrition (NIN), Hyderabad. The data cleaning was done by carrying out range and consistency checks. Descriptive and advance analytical statistics of the data were carried out using SPSS Windows version 19.0 . 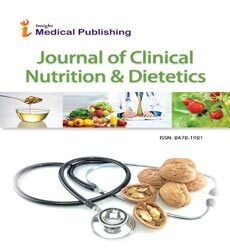 Proportion test with 95% CI, bivariate and multivariate logistic regression analysis was carried out to know the important factors associated with under-nutrition. Significance was considered at p<0.05 level. Nutritional status of children was assessed according to SD classification , using WHO standards . Children who were below two standard deviation (SD) of the reference median (<Median-2SD) on the basis of ‘weight-for-age’, ‘height-for-age’ and ‘weight-for-height’ indices were classified as underweight, stunting and wasting respectively, while children who were below 3SD values of the reference median (<Median-3SD) were classified as ‘severe underweight’, ‘severe stunting’ and ‘severe wasting’ respectively. Household wealth was assessed by using principal components analysis (factor analysis). A total of 3133 children (boys: 1594, girls: 1528; rural: 2600, urban: 533), with mean age of 26.2 ± 15.9 months, under 5 years were covered. The details of socioeconomic and demographic particulars are given in Table 1. About three fourth (76%) of HHs belonged to ST communities in rural areas, while 82% belonged to other communities in urban areas. About half (50.7%) of HHs were living in kutcha houses in rural areas, while 61% were living in pucca houses in urban areas. The proportion of illiterate parents was slightly more in rural (14.9% & 19.4%) as compared to urban (10% & 17%) areas. Only 28% of HHs in rural and 89% in urban areas had access to safe drinking water (tap water). Only 34% of HHs from rural and 87% HHs from urban areas were using sanitary latrine. Average per capita income was low (Rs 1040 ± 1185) in rural as compared to urban (1610 ± 1015) areas (Table 1). Table 1: HHs socio-economic and demographic particulars of study subjects. Pre-lacteals such as glucose/plain water, honey, and jiggery, etc were given to 16% of new born. More than half (56%) of mothers initiated breastfeeding (BF) within 1 hour in rural areas, while only 38% does so in urban areas. About 20% and 60% were exclusively breast fed up to 6 months in urban & rural areas respectively. About 70-75% children of 6-11 months received complementary feeding in addition to breast milk, while only 25% received the same at 6 months of age (Table 2). Table 2: Distribution (%) of feeding practices among 0-11 month children. About 24% children had suffered from at least one morbidity (i.e., fever, diarrhea, acute respiratory infection) during the preceding fortnight. The proportion of morbidity was significantly (p<0.01) higher among 12-35 month children (29%) as compared to 36-59 month children (17%). The prevalence of underweight was 44% (CI=42.5-45.9%) and was higher among boys (45.8%; CI=43.3-48.2%) as compared to girls (42.6%; CI=40.1-45.1%). The overall prevalence of stunting was 39%; CI=37.2-40.6% (Boys; 40.1%; CI=37.7- 42.5%, Girls: 37.7%; CI=35.2-40.1%), while that of wasting was 22.5%; CI=21.1-23.9% (Boys: 25.1%; CI=22.9-27.2%, Girls: 19.8%; CI=17.8-21.8%) (Figure 1). The prevalence was significantly (p<0.01) higher among children from rural (46.7%, 40.3%, & 23.7% respectively) as compared to urban areas (32%, 32.5% & 16.4% respectively) (Figure 1). The prevalence of severe underweight, severe stunting and severe wasting was 14%, 12% and 6% respectively. 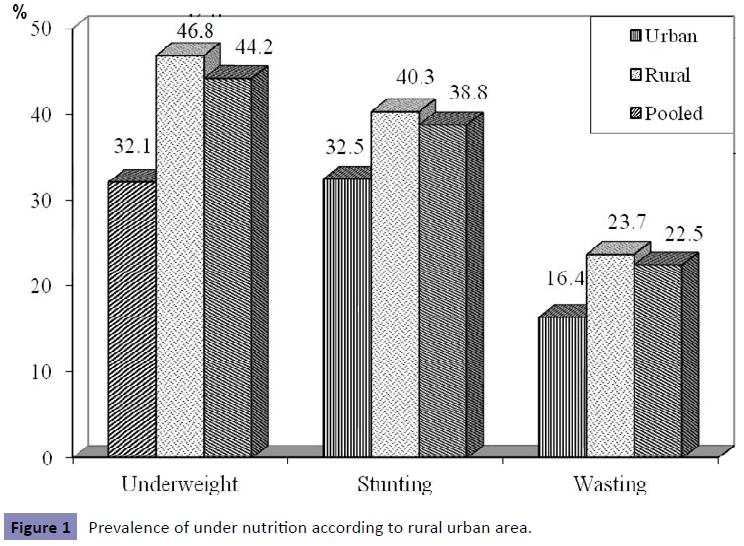 Figure 1: Prevalence of under nutrition according to rural urban area. The prevalence of under nutrition was higher among children from Dangs district (underweight: 61% CI=57.1-65.1%, stunting: 45.7% CI=41.6-49.8%, wasting: 36.2%, CI=32.4- 40.3%), and was lowest in Navsari district (underweight: 36.7%, CI=32.5-41.2%, stunting: 37.4%, CI=33.1-41.8%, wasting: 16.6%, CI=13.5-20.2%) (Figure 2). 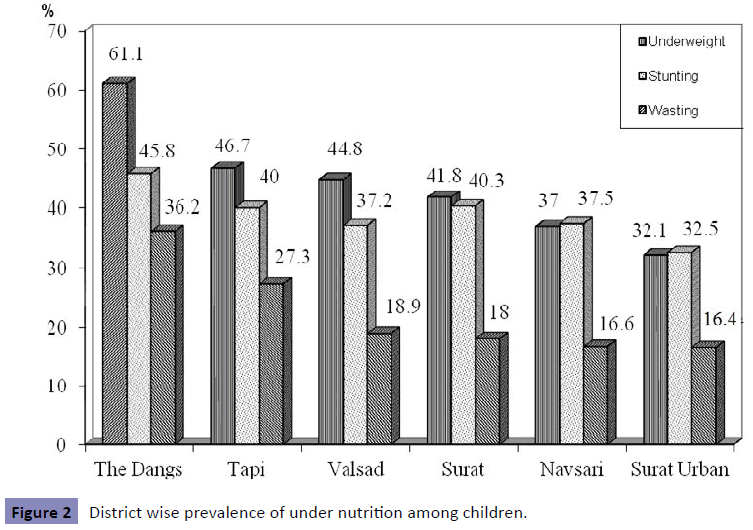 Figure 2: District wise prevalence of under nutrition among children. Bivariate logistic regression analysis between undernutrition and socio-economic and demographic variables revealed that the risk of underweight and stunting was significantly (p<0.01) higher among children from rural areas, among children belonging to SC and ST communities, among children of nuclear families, children of illiterate parents, and children belonging to lower and middle income groups (Table 3). Table 3: Bivariate logistic regression analysis for undernutrition as dependant and socio-economic, demographic factors and type of area as independent variable (OR with 95% CI). Underweight and stunting was observed to be significantly (p<0.01) associated with age & parity of the mother, number of antenatal care visits, place of delivery, person conducted delivery, birth weight and hand washing practices of mother, while wasting was observed to be significantly associated with hygienic practices of mothers (Table 4). Table 4: Bivariate logistic regression analysis for undernutrition as dependant and maternal particulars, delivery and IYCF practices as independent variable among 0-11 month children (OR with 95% CI). Stepwise logistic regression was carried out considering all significant variables in bivariate analysis. The risk of undernutrition was higher among older children (12-59 months) as compared to younger children (0-11 months) and among boys compared to girls. The risk of underweight and stunting was significantly (p<0.01) higher among children from rural areas as compared to children from urban areas. The risk of underweight and stunting was 2 times higher among children belonging to scheduled tribe community (OR 1.75; CI=1.38-2.2.23 & OR 1.60; CI=1.21-2.13 respectively) compared to others. Children belonging to lower socioeconomic groups (lower wealth index) had 1.7 times higher risk of underweight (or 1.7; CI=1.32-2.22)) and wasting (OR 1.77; CI= 1.30-2.42) as compared to children from high socioeconomic groups. Risk of underweight was 1.7 times higher among children of illiterate mothers (CI=1.27-2.15) and those studied up to 7th standard (OR 1.6; CI=1.25-2.01) as compared to children whose mothers were educated more than 10th class (Table 5). Table 5: Logistic regression analysis for undernutrition as dependant and socio-demographic variables as independent variable among <5 year children. Among 0-11 month children, the risk of under nutrition was significantly associated with place of delivery, birth weight and hygienic practices. Children born at home had 2 times higher risk of underweight (OR 1.65, 1.08-2.52) as compared to children born in hospitals/health institutions. Low birth weight (<2.5 kg) had 3 times higher risk of underweight (OR 2.88; 1.82-5.54) and stunting (OR 2.97; 1.81-4.74) as compared to normal weight children. Hand washing by mothers with soap before feeding the child was significantly associated with underweight, stunting and wasting with 1.5 to 1.7 times higher risk for children whose mothers did not wash their hands before feeding the child (OR 1.67, 1.73 & 1.5 respectively) (Table 5). Gujarat is one of fastest growing state in the form of the industrial growth and other infrastructural facilities and Surat is commercial hub of Gujarat. However, same is not reflected in terms of nutritional status in Surat region. The study reported that the prevalence of undernutrition was high in rural as compared to urban areas. This may be due to high per capita income and literacy of parents in urban areas as compared to rural areas as well as the proportion of tribal population. The present study reported that the overall prevalence of underweight, stunting and wasting was 44%, 39% and 22.5% respectively, which is similar to the study carried out by NNMB during 2007-09 in tribal areas of Gujarat except prevalence of stunting which was 53% (underweight: 47%, & wasting: 25% respectively) . Meshram et al. reported 64%, 61% and 29% prevalence of underweight, stunting and wasting respectively in the tribal preschool children in Maharashtra , while another study carried out by NIN in Madhya Pradesh during 2010 also reported high prevalence of undernutrition among fewer than 5 children in tribal districts . Stepwise logistic regression analysis revealed that the undernutrition was associated with age, gender, community, literacy of mother and wealth index. Lower rates of undernutrition among infants are mostly attributed to the protection offered by breast milk during infancy. High rates of undernutrition in younger children may be due to faulty feeding practices in terms of quantity, quality and frequency of complementary feeding along with higher rates of morbidities among 12-35 month children . Maternal literacy level had significant role in undernutrition. Well educated mothers had efficient management with limited resources, greater health care utilization, better health promoting behavior, low fertility and more child caring practices [18, 19]. Educated girls married lately than non educated girls and mostly engaged in economic activities outside the home, late child bearing, have fewer children and provide better care and nutrition for self and child which reduces the probability of morbidities and hence better survival and nutritional status of their children . HHs wealth index is an indicator of socio-economic development as observed in this study as the risk of undernutrition was higher among children from lower wealth index. Lower socioeconomic status is associated with low literacy, low purchasing power, and food insecurity resulting in higher rates of undernutrition . Also lower SES is associated with less utilization of health care during pregnancy, low nutrient intake and more chances of home delivery, all contributing to higher rates of undernutrition among children. Prevalence of under nutrition was higher among boys compared to girls. Although the exact mechanism is unclear, it may be due to natural protection offered to female. Among infants, only place of delivery and birth weight was observed to be associated with under nutrition which is similar to the findings of other studies . Poor maternal nutrition results in low birth weight which is important determinant of undernutrition and morbidity among children. High prevalence of diarrheal diseases among children is mostly due to low sanitation as observed in the present study where only 34% HHs had sanitary latrine facilities and poor hygienic practices. The results of the study indicates that undernutrition is still an important public health problem among children in Surat division of Gujarat especially in tribal dominated areas and was significantly associated with gender, community, wealth index and education of mother, as well as place of delivery and birth weight among infants. Strengthening of health care services such as ANC services, promotion of institutional deliveries, strengthening IYCF practices along with improving maternal education, promotion of maternal health, improving socio-economic status of HH by employment opportunities, personal hygiene and sanitation might help to improve nutritional status of children. Authors are thankful to the Principal Secretary, Deputy & Joint Secretaries, Director and Deputy Director, Women and Child Development & Social Justice Department, Ministry of Health & Family Welfare, Government of Gujarat for providing an opportunity to carry out this study. We are also thankful to the Director, NIOH, Ahmedabad for providing infrastructural facility. We are also thankful to Child Development Project Officers, Supervisors, Anganwadi Workers (AWWs), and ASHA workers (Health functionaries) for their help during execution of the survey. Our sincere thanks to the entire field staff for their sincere efforts in the data collection. We also thank Mr. G Manohar Reddy, Research Officer, and others for their technical help. This work was supported by Department of Women and Child Development, Ministry of Health, Government of Gujarat, India. All the authors were involved in the study design and protocol development. All the authors except 7, 8 & 9 were involved in training to investigators, standardization in data collection and other investigations, execution of survey and supervision. All the authors except 8 were involved in preparation of report. Author 1 prepared a manuscript. Author 8 was involved in statistical analysis. All the authors reviewed the manuscript and approved the final version submitted for publication. World food insecurity and malnutrition(2013): Scope, trends, causes and consequences. International Institute for Population Sciences: National Family Health Survey (NFHS-3), 2005-06 Mumbai, India (2007): International Institute for Population Sciences (IIPS) and Macro International. National Nutrition Monitoring Bureau (2012)Diet and nutritional status of rural population and prevalence of HTN, DM among adults and infant & young child feeding practices –Report of third repeat survey.National Institute of Nutrition (ICMR), Hyderabad, NNMB Tech. Rep. No.26. National sample survey organization: NSSO survey 1973-2005. Naylor RL, Liska AJ, Burke MB, Falcon WP, Gaskell JC, Rozelle SD, etal. (2007) The ripple effect: biofuels, food security, and the environment. Environment & Policy sustainable development 49: 30–43. Jelliffee DB, Jelliffee EP (1990)Community nutritional assessment. Oxford, Oxford University Press. PO7- Disorders related to short gestation and low birth weight in ICD-10. Rutstein SO, Kiersten J (2004) The DHS wealth index. DHS Comparative Reports No. 6. Calverton, Maryland: ORC Macro. Filmer D, Pritchett LH (2001) Estimating wealth effects without expenditure data–or tears: an application to educational enrolments in States of India. Demography 38:115-32. World Health Organization (2001)The Optimal duration of exclusive breast-feeding: Report of the expert Consultation of the optimal duration of exclusive breastfeeding. Geneva, Switzerland. SPSS Inc. (2009) The SPSS guide to data analysis (Release 19.0). USA: Chicago. World Health Organization (1983)Measuring change in nutritional status. World Health Organization, Multicentre Growth Reference Study Group (2006) WHO Child Growth Standards based on length/height, weight and age.ActaPaediatrSuppl450:76-85. National Nutrition Monitoring Bureau (NNMB) (2010)Diet and nutritional status and prevalence of HTN among adult tribal population –Report of second repeat survey.National Institute of Nutrition (ICMR), Hyderabad, Tech. Rep. No. 25. Meshram II,Arlappa N, Balakrishna N, Laxmaiah A, MallikharjunRao K, Gal Reddy CH, Ravindranath M, Sharad Kumar S, Brahmam GNV, et al. (2012) Prevalence and Determinants of Undernutrition and its Trends among Pre-School Tribal Children of Maharashtra State, India. J Trop Pediatrics 58:125-32. National Nutrition Monitoring Bureau (2011) Assessment of nutritional status of under 5 year children rural children in the districts of Madhya Pradesh-Districts pooled report.National Institute of Nutrition (ICMR), Hyderabad. Ministry of Health and family welfare (2013) Guidelines for optimal infant and young child feeding practices. Government of India. Abuya Ba, Ciera J, Kimani-Murage E (2012) Effect of mother’s education on child’s nutritional status in the slums of Nairobi. BMC pediatr12:80. Frost MB, Forste R, Haas DW (2005)Maternal education and child nutritional status in Bolivia: finding the links. SocSci Med60:395-407. Murphy E, Carr D (2007) Powerful Partners: Adolescent girls’ Education and delayed child bearing. Population Reference Bureau (PRB). Rohner F, Tschannen AB, Northrop-Clewes C, Kouassi-Gohou V, Bosso PE, Mascie-Taylor CG, et al. (2012) Comparison of a possession score and a poverty index in predicting anaemia and undernutrition in pre-school children and women of reproductive age in rural and urban Côte d'Ivoire. Public Health Nutr15:1620-1629. Meshram II,Laxmaiah A, Gal Reddy CH, Ravindranath M, Venkaiah K, Brahmam GNV, et al. (2011)Prevalence of undernutrition& its correlates among under 3-year old children in rural areas of Andhra Pradesh, India. Ann Hum Biology38:93-101.